Ojama Yellow, Ojama Green, Ojama Black and Harpie Lady 1 (equipped with Electro-Whip) appear in this card's artwork. The Field Spell Cards in the Tag Force series video games are animated when activated. The background animations vary between games. In Tag Force 2, the Ojamas attempt to jump onto the back of Harpie Lady only to be thrown off and scattered as she swipes at them. In Tag Force 1 and 3-6, they circle around her in formation to defeat her. The Rise of Destiny Spanish print of this card has a small typo in its name, as it's printed as Territorio de Caza de las Arpias instead of Territorio de Caza de las Arpías. While "Harpies' Hunting Ground" is face-up, if multiple copies of "Harpie Lady" are Special Summoned simultaneously by the effect of "Hysteric Party", the effect of "Harpies' Hunting Ground" activates only once time and destroys only 1 Spell or Trap Card on the field. : While "Harpies' Hunting Ground" is face-up, if multiple copies of "Harpie Lady" are Special Summoned simultaneously by the effect of "Hysteric Party", does the effect of "Harpies' Hunting Ground" that destroys 1 Spell or Trap Card on the field activate a number of times equal to the number of copies of "Harpie Lady" that were Special Summoned? 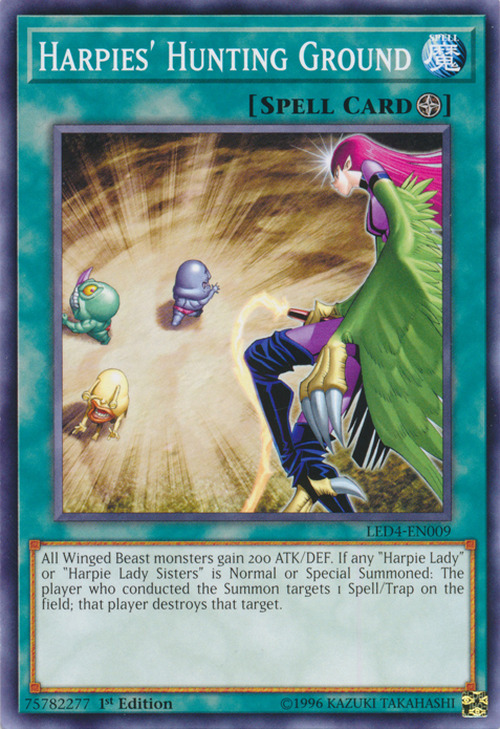 While "Harpies' Hunting Ground" is face-up, "Call of the Haunted" is activated in Chain to the activation of "Skill Drain", and Special Summons "Harpie Queen" from the Graveyard. In this case, the effect of "Harpies' Hunting Ground" activates after the first Chain resolve: If the name of a Special Summoned "Harpie Queen" is not treated as "Harpie Lady" due to a Chained "Skill Drain" etc., does the effect of "Harpies' Hunting Ground" activate? You can chain to the effect of "Harpies' Hunting Ground" that destroys 1 Spell or Trap Card. The effect of "Harpies' Hunting Ground" that increases ATK and DEF is applied to all face-up Winged Beast-Type monsters on the field, including your opponent's, because it is a Field Spell Card. If you control "Harpies' Hunting Ground" on your side of the field, because it is a Field Spell Card, its effects apply to both players. When either player Normal Summons or Special Summons a "Harpie Lady" or "Harpie Lady Sisters" to the field, the controller of that newly-Summoned monster is the one who selects 1 Spell or Trap Card and destroys it.The latest print of "Harpies' Hunting Ground" has Problem-Solving Card Text which shows that it is the player who conducted the Summon, not the player who controls the monster, who targets a Spell/Trap Card to destroy.